Charlie killed about 10-12 of them around the outside of the house last week, but this is the first time I've seen one 'inside'. YIikes!! That would not be something I'd want to run into in any part of my house - or outside. The photography is great, but you can have the spider! even living over here and dealing with spiders daily i still cannot warm to them yukk ! 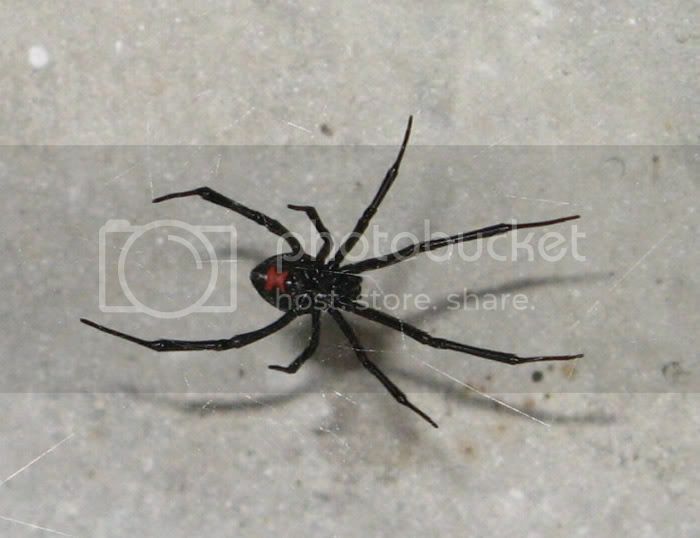 I have to agree great pic ,it look similar to our red back spider , do you get those at all ? Amanda - Pugs Washington , Cha , Ferguson & Nike. Not really one I would want lurking around though! Well,I don't know...I think it looks cute!! I think I just lost 15lbs! that thing is HUGE we have them around here but i have yet to see one and I'll keep it that way thank you . Did you kill it? HOLEY SMOKES! Are you trying to give me a heartattack? I'm so terrified of spiders, I can't even stand pics of them. EWWY! Kill them all! *shudders* EEK!!! How scary! I would be terrified and screaming! lol One of my biggest bug fears are roaches! Where are the spider experts from PT? I'd like to have a classification. What a great picture. The magnificent spider you see photographed is a black widow. I'm not an expert yet...hopefully someday. The venom of the female black widow spider is 15 times as toxic as the venom of the Prairie Rattlesnake. Only a minute amount of the toxin is injected in a single bite by the spider however, so they are rarely fatal. By comparison, the relatively large amount of injected rattlesnake venom results in about 15 to 25 percent mortality among those bitten. The bite itself is often not painful and may go unnoticed. But the poison injected by the the Black Widow bite can cause abdominal pain similar to appendicitis as well as pain to muscles or the soles of the feet. Other symptoms include alternating salivation and dry-mouth, paralysis of the diaphragm, profuse sweating and swollen eyelids. Persons with heart conditions or other health problems may require a hospital stay. (Heart and lung failure may result in death.) A physician can evaluate the severity of the bite, and give specific antivenin or calcium gluconate to relieve pain if necessary. Healthy people recover rapidly in two to five days. No question, a beautiful female Southern Black Widow (Latrodectus mactans). I think these are among the most beautiful creatures on earth. I actually have one in my house right now. I don't really call my spiders pets, but she does live in a plastic box in my library. I rarely find them around here, but when I do, I just move them away from habitated areas. They really don't tend to wander very much, and since I don't have young children, I don't worry about them very much. It's Brown Recluse that I don't really care for. Last edited by Mygala; 06-15-2007 at 05:20 AM. Last edited by Cavy Boar; 06-15-2007 at 06:29 AM.